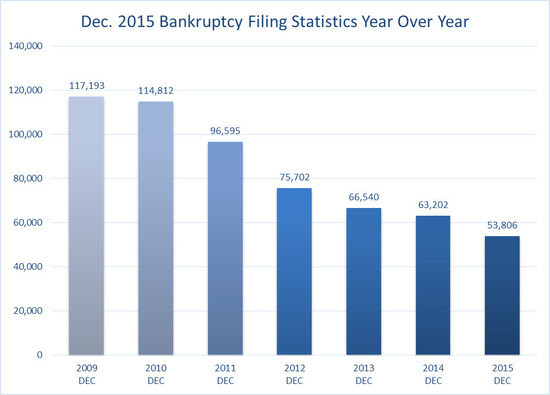 After experiencing an uncharacteristic year-over-year increase in November, bankruptcy filings took another customary tumble in December 2015, falling by about 15 percent from the previous December, according to December 2015 AACER bankruptcy data reported by Epiq Systems this week. The 53,806 bankruptcy filings nationwide reported for December 2015 represented a decline of 9,396 from the previous December’s total of 63,202. The number of filings has dropped year-over-year every December since 2010. Monthly, bankruptcy filings fell by about 18 percent from November’s total of 65,511. December’s total of nearly 54,000 filings represented a decline of about 54 percent from December 2009’s peak total of 117,193. In 22 filing days in December 2015, bankruptcy filings averaged 2,446 per day—the lowest daily average recorded for any one month in 2015, beating the previous low of 2,955 in January. The total number of filings for the calendar year 2015 was 819,240, an average of 68,270 per month and 3,264 per day over 251 filing days. California topped all states for total bankruptcy filings in 2015 with 80,382 for the whole year (including 5,027 in December, also tops among states for the month, though it was way down from California’s November total of 6,471). Illinois was second with 56,004 filings in 2015, and Florida was a close third with 54,267. Georgia (49,334) and Ohio (36,959) were fourth and fifth, respectively for the most cumulative filings in 2015. The state with the fewest cumulative filings was Alaska with 441 after experiencing just 24 bankruptcy filings in December. Tennessee and Alabama ranked first and second among states in filings per capita for December with 5.73 and 5.36 filings for every 10,000 people, respectively. These states finished first and second in bankruptcy filings per capita for every month in 2015. Both totals represented slight declines from the 5.80 and 5.41 totals reported for November. December’s national average in bankruptcy filings per capita (2.63) was down from November’s total of 2.69 after remaining flat from October to November. Epiq Systems is a leading global provider of technology-enabled solutions for electronic discovery, bankruptcy and class action administration. Top legal professionals depend on us for deep subject-matter expertise and years of firsthand experience working on many of the largest, most high-profile and complex client engagements. Epiq Systems, Inc. has locations in the United States, Europe and Asia.